Posted in English, myEnglish, Young Learners on February 16, 2017 by Alisha Debara. 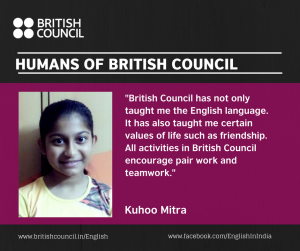 I am Kuhoo Mitra. I am presently thirteen years old. My hobbies mainly include reading storybooks, writing short stories and drawing. My aspiration is to travel around the world. In reality, I do not currently have too many opportunities to travel the world. However, I have another option and that is through books. Books always transport me to a place far from reality to places I have only ever dreamed of going to and, of course, to places I shall never be able to go to since they exist only in the world of books and fiction. A girl of class eight, still in school, I usually am cheerful and joyous and as many put it, extremely talkative. Coming to my dislikes, I absolutely dread Maths! Apart from that, there are quite a few things that I don’t like such as holidays when I’m forced to stay at home and Chemistry lessons in school. My goal in life is to become an author and that was the main reason I joined British Council. I have forever loved English, both as a language and as a subject. As I’ve stated above, I want to be an author when I grow up. Though I could speak, read and write English fairly well I felt that I needed to improve to achieve my goal in life. That was when my thoughts turned to British Council. I have been a member of this library since when I was very small, maybe seven. Even then I would come to the library quite often for various workshops including those about art. It first struck me when I was in class six that I needed to improve my English. There was more to this language than the stories and poems I had learnt in my literature class in school. I wanted to go into the depth of this language, find out more about it. It took me one more year to realise that the perfect place for this was none other than British Council. I have been a member of this library since when I was very small, maybe seven. Even then I would come to the library quite often for various workshops including those about art. It first struck me when I was in class six that I needed to improve my English. There was more to this language than the stories and poems I had learned in my literature class in school. I wanted to go into the depth of this language, find out more about it. It took me one more year to realise that the perfect place for this was none other than British Council. I don’t quite remember my first time here or how I had found out about British Council. But I do remember how I found out about the classes. Since I regularly visit the British Council Library, I know almost everyone there. It was one of the administrators who had first mentioned these classes while talking to me and my mother. It was decided- I would take these classes. Thus, I appeared for my level test and joined the British Council classes for the first time. I have been part of the British Council for so long that today it’s almost home to me. I cry when I hear I’ll have to miss a class and though I know that I’ll be leaving this place after the sixth module, it still seems unbelievable that I won’t come here every week- something that I’ve been doing for the past two years. So, I can’t state one thing that I’ll remember about this wonderful time. There are loads of memories from this time that I will treasure all my life. The very first one is counting down my days to the next Saturday, that feeling of excitement on a Friday evening, the happiness in the air on a Saturday morning and, of course, feeling sad when the class comes to an end. British Council has not only taught me the English language. It has also taught me certain values of life such as friendship. All activities in British Council encourage pair work and teamwork. And as we all know pair work and teamwork help to build strong friendships because that’s when we help each other to succeed. There’s a quote which says- “Teamwork divides the task and multiplies the success”. Because of this, I made several wonderful friends here in British Council and they are people I can never forget. But most of all the people whom I shall remember forever are the teachers who taught me. They stood by my side not only when I was in trouble but also during moments of happiness. They are teachers who are very friendly and the learning experience is fun all because of them. I will never forget them. British Council has also completely changed my views about learning. Before, learning to me meant burying my head into big, fat textbooks and mugging up chapters. School taught me that learning is about understanding concepts and being able to do well in your exams. From others, I heard that learning is just another synonym of ‘studying’. But after joining British Council I realised that all these ideas were wrong. Learning is about increasing your knowledge. To learn, you don’t need to study from textbooks. Neither do you need to get full marks in your exams. All you need to do to learn is understand and remember. But learning isn’t complete without an element of fun in it because I feel that to learn you need to enjoy learning more and more. And British Council is a place that is full of fun and enjoyment. My advice to a person looking to learn something new would be to join an institute which allows people to think on their own, where, like at British Council, ‘no answer is a wrong answer’, where people have lots of fun through learning itself. 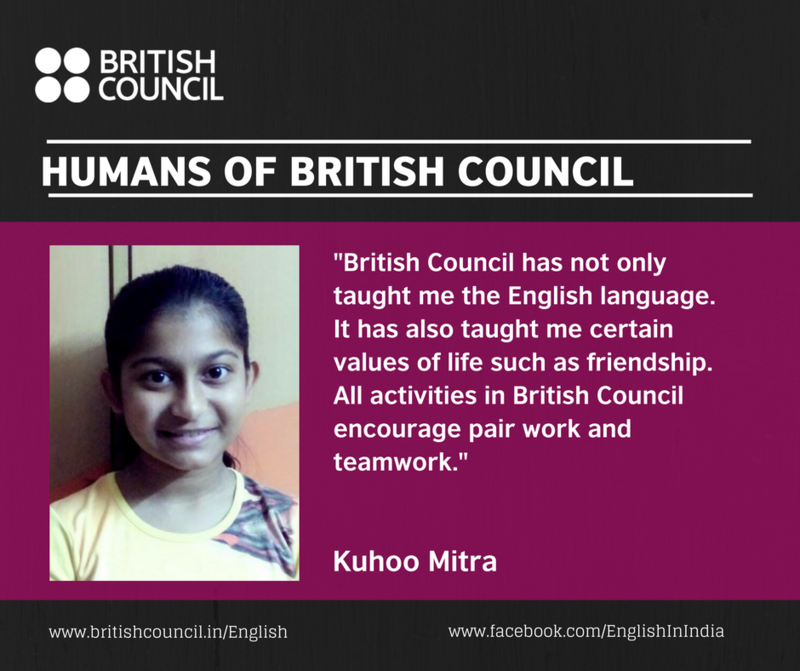 And if the person wants to learn or improve his/her English or wants to learn something new about the language then I would surely recommend that he/she joins the British Council.